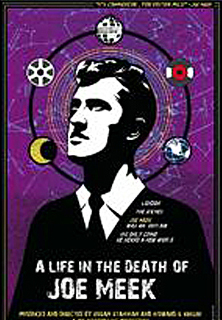 Director Howard S. Berger contacted me with some news about his fascinating new documentary A Life in the Death of Joe Meek (2008) which focuses on the troubled life of the British music maven Joe Meek who I wrote about a few months ago in a piece titled The Mod Musicals of Lance Comfort. A Life in the Death of Joe Meek is currently scheduled to play at the upcoming Cambridge Film Festival on September 23 and at London’s Raindance Film Festival on October 4th. If you’re in the U.K. you won’t want to miss the opportunity to see this important documentary that traces the rise and fall of Joe Meek from childhood to his unfortunate and troubling death in 1967. For more information about the film as well as news about upcoming screenings I highly recommend visiting the official Joe Meek documentary Myspace page. I wish I was in the U.K. period. But I’m here. Alas. I wish I were in the UK but mostly for the birds and the bangers and mash, Bob’s your uncle, blimey. I would pack up and relocate to the UK in a heartbeat if I could. My heart belongs to Britain. It’s very good information about films.